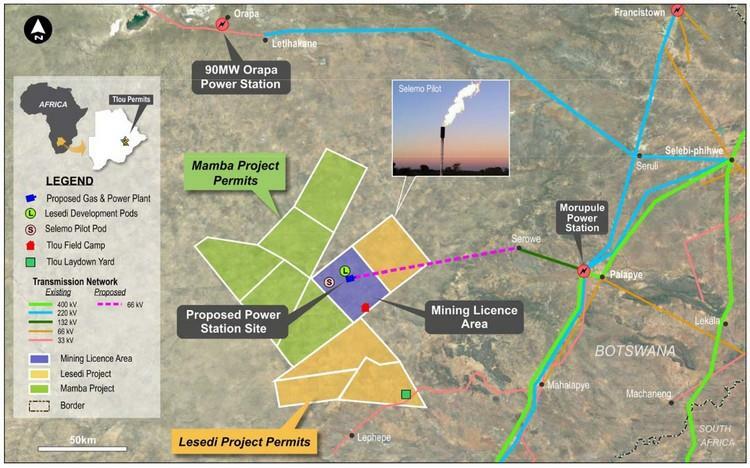 Tlou Energy, the ASX, AIM and BSE listed company focused on delivering power in Botswana and southern Africa through the development of coal bed methane ('CBM') has provided an update on the status of field operations at the Lesedi CBM Project in Botswana. All wells in the current program have now been drilled with expenditure to date in line with budget. Tlou Energy has drilled all six wells which comprise the Lesedi 3 and Lesedi 4 development pods (each pod comprising one vertical production well and two lateral wells) as part of the recent field drilling program. The drilling program was carried out efficiently and safely as a result of the excellent work of the field personnel. The Lesedi 3 and 4 development pods are located adjacent to the Company’s proposed central gas gathering and power generation facility. This is in a geological region that has intersected a gassier trend based on an extensive geological review of the sub-surface using all available geological and production data to date. Prior to starting the program, the Company purchased a significant amount of drilling equipment which enabled Tlou to control costs and timing of the program. The net result is that the drilling program was completed on time and in line with budget. This is a significant achievement and demonstrates the Company’s ability to deliver a cost effective and timely program in the Kalahari Desert. Very importantly, when the lateral wells intersected the vertical production wells, a significant amount of gas was observed bubbling from the production wells. This occurred on both the Lesedi 3P and 4P intersects but particularly on Lesedi 4P. In the Lesedi 4 development pod, the Company targeted the upper portion of the coal seam. This may be very significant for future drilling campaigns and, when combined with recently evaluated structural trends, may provide the key to unlocking significant amounts of new gas reserves. The wells will continue to de-water over the coming weeks with first indications of controlled gas pressure increasing anticipated in 2Q19. A global information service for upstream oil and gas opportunities - divestitures, farmins and farmouts and licensing rounds. energy-pedia news is a FREE news service written and edited by E and P professionals for E and P professionals. We don't just report the news, we give you the technical background as well, with additional information derived from our unique energy-pedia opportunities service.